Rosh Hashanah, the Jewish New Year and first of the High Holidays, begins at sundown. Among the traditional celebratory foods is round challah bread, which represents the cyclical year. 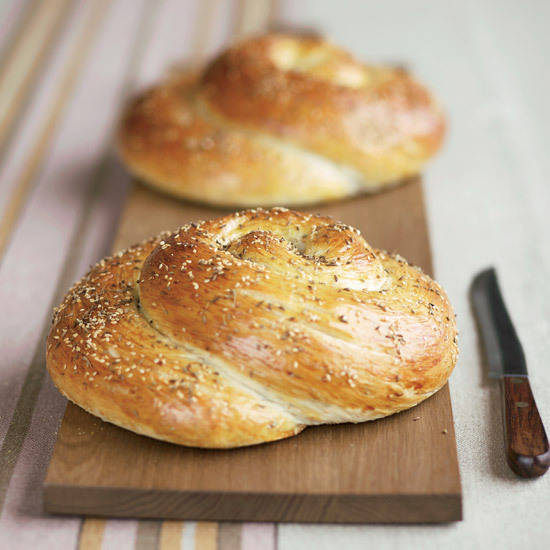 From a classic braided loaf to a lemony soufflé, here are seven fantastic challah recipes. Upgrade the classic bread with a generous sprinkling of seeds such as poppy or sesame. This delicious brunch dish features creamy scrambled eggs topped with briny paddlefish caviar. Caraway and anise flavor this round, turban-shaped version. This terrific dessert combines challah bread cubes and lemony custard. Each person can have his or her own little bird, filled with fluffy challah. Put leftover challah to good use with this wonderful breakfast recipe. Bourbon-spiked caramel sauce tops this incredible challah-based dessert.